One of my daughters is allergic to nuts, but she isn't allergic to almonds, hazelnuts or macadamia nuts. So when I found the August 28th RedPlum coupon for $1.00 off Nutella, I stocked up on it for our food storage! She was more than excited. 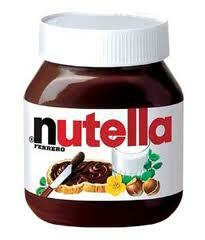 Yes, Nutella has sugar, but there are 50 hazelnuts in each 13 oz. jar and 3 grams of protein. With the coupon it is the same price as the 3 pk. at Sam’s Club, but I couldn't buy my other items at Sam's Club. Check out this week's great shopping deals. Final Price: .50 each bag! Johnson & Johnson Reach Floss 55 yd. .95 reg. Buy Oral B Cross Action electric toothbrush $7.99 reg. Thanks! I found a few more coupons and have Fresh Market close by.